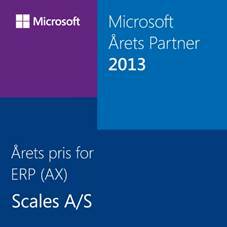 We are proud to announce that SCALES have won the ERP (AX) partner of the year Award ! At the Microsoft Partner Award, SCALES won the prestigious category "ERP PARTNER of the year". A huge recognition of the work all our skilled employees perform every day. "This year's Enterprise Partner of ERP (Dynamics AX) have distinguished themselves by in the past year to gain a foothold in the enterprise market. They are always at the forefront of the latest versions and targeted investments in capacity building. They have provided some important customer projects at AX2012 and has shown that investment in skills driving business growth and high customer satisfaction, "said Maja Lion Dybdahl, Partner Manager Dynamics, Microsoft Denmark.